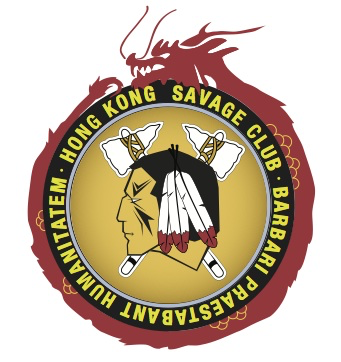 The Hong Kong Savage Club was founded in August 2013 and is registered as a Non-Exempt society under the Societies Ordinance (CAP 151), having both social and charitable objects. The concept of forming a Hong Kong Savage Club originated with the founding Chairman, who having been a member of the Shanghai Savage Club for just over a year (and subsequently a member of the London club), was convinced there was room for something a little more “eclectic” than existed already in Hong Kong. In fact it was a surprise to many that the “Savages” had not made it there before, especially given Hong Kong’s reputation as a clubbable city. However a Savage Club did exist in Shanghai in the 1870's and it remained active through the 1880's and 90's. The object of the Hong Kong Savage Club is to foster a spirit of friendship or bonhomie amongst gentlemen of discerning nature, living and working in Hong Kong or Macau, whilst at the same time fostering an environment for charitable giving (according to one’s means) and providing an informal social network. This is achieved in the main within a convivial atmosphere over; inter alia, a “long lunch” on the third Friday of every month. Given the origins of the original, and subsequent Savage clubs around the world, it was felt that the links to Savagery had to be maintained, but with that human touch that epitomises its members. Many a Latin scholar was consulted, but the best we could arrive at was “Barbari praestabant humanitatem”, or the “Savages showed humanity”. The native Indian figurehead has been kept in deference to the London Club’s links to Richard Savage, after whom the Club was named. The dragon that surrounds the logo itself, is coloured red corresponding with fire, and symbolizes good fortune and joy in local culture. Likewise, the gold or yellow infill signifies neutrality and good luck. Yellow is sometimes paired with red in place of gold, and also represents freedom from worldly cares, a familiar feeling after most Long Lunches! 19/F., NO. 178-180 QUEEN'S ROAD CENTRAL, HONG KONG.